These muffins were not supposed to happen. I wanted to make blueberry sour cream donuts and thought I had a bag of frozen blueberries on hand but realized, whoops, I didn’t. I did, however, have frozen mango chunks on hand. I always have those on hand. I included sour cream in the muffins that I had intended to use in the blueberry donuts because sour cream not only gives a tiny bit of tang and zip, it also keeps baked goods moist. So the blueberry sour cream donuts became mango and sour cream muffins. Not a bad trade. 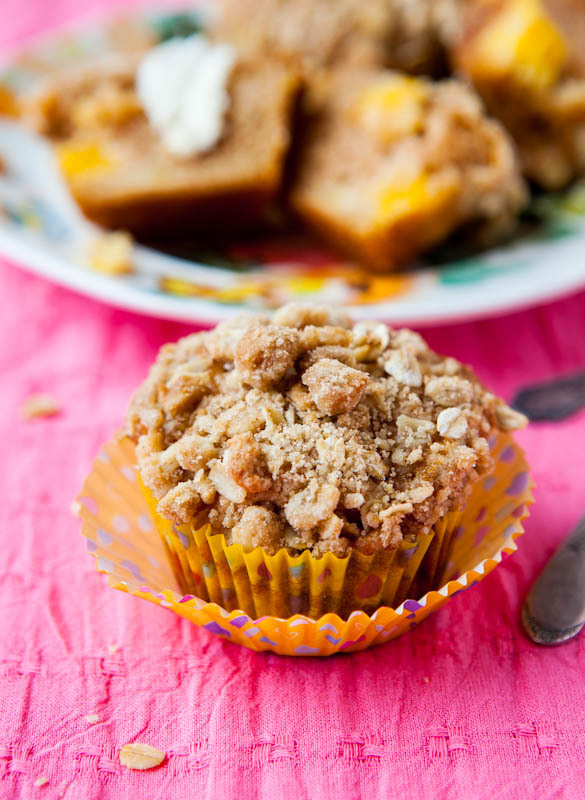 There was no way I was going to bake muffins without adding a streusel topping. I love it and would be content just eating muffin tops or anything that has a nice streusely layer dotted with crumbly nuggets. 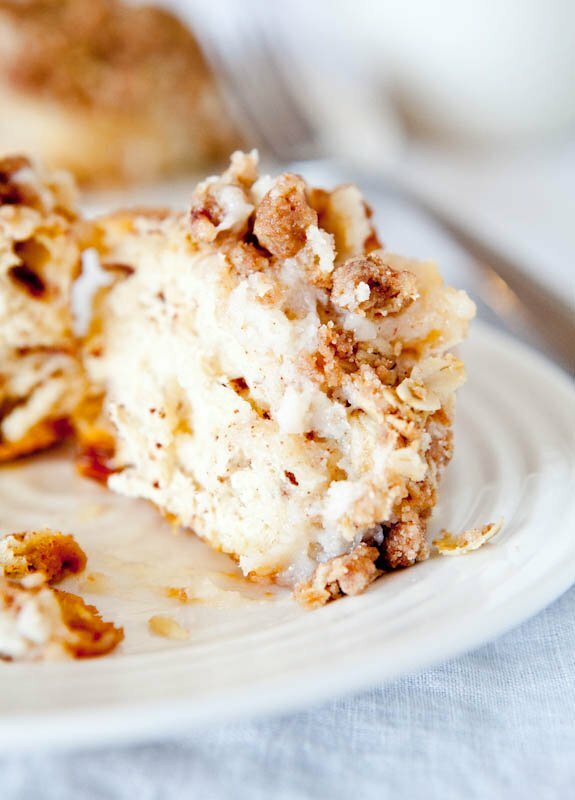 After all, streusel or crumble topping is nothing more than melted butter, brown sugar, cinnamon, oats, and flour. Can’t go wrong there. I never use nuts in my topping because I hate nuts in baked goods, but I know some people toss those in, too. For me, that would ruin the sandy smooth and buttery little pebbles. As is the case with anything I make, I try to dirty the least amount of dishes possible and only use a mixer when absolutely necessary. These are a stir by hand in one bowl recipe. Okay, the crumble topping bowl adds a small second bowl. As is the case when baking with fruit, these turned out so nice and moist. The fruit releases its natural juices and in muffin or quick-bread baking, natural juices are great. 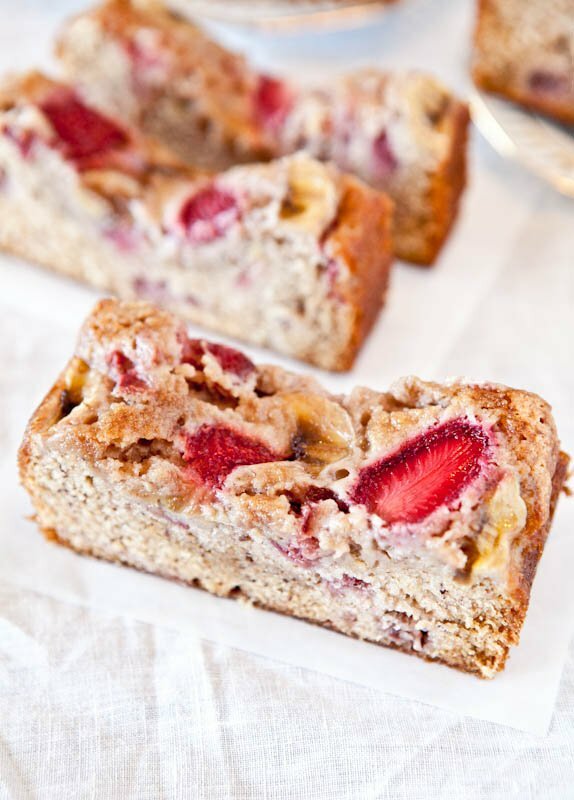 Strawberry Banana Bread comes to mind. 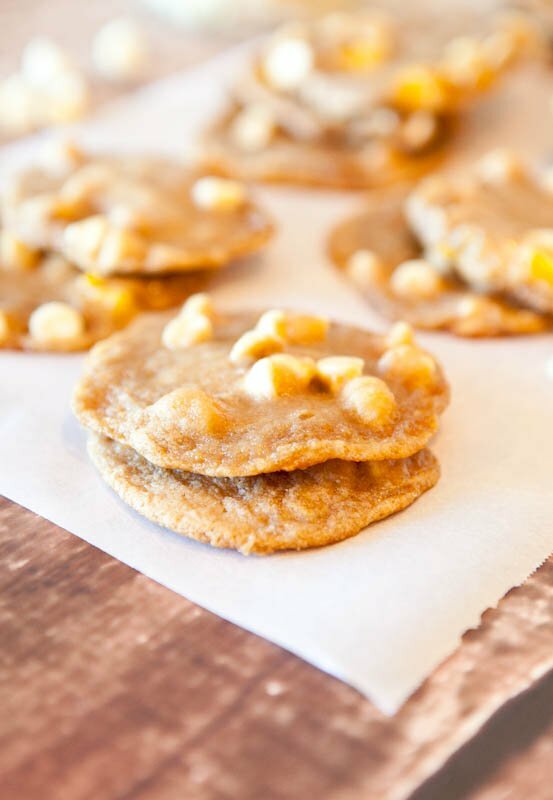 In cookie baking, the extra moisture can make Mango White Chocolate Cookies become a little too flat. The taste is great but they become moisture-logged and flatten out. 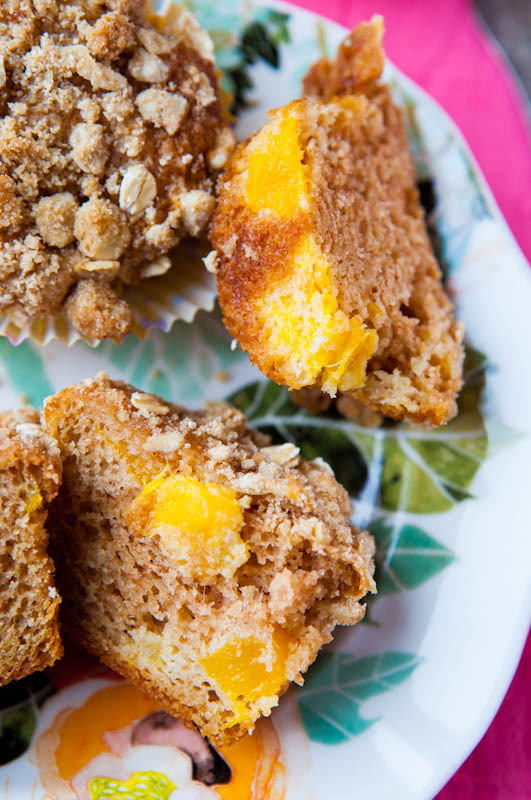 But in muffins, the juicy mango kept them soft and spongy. Although they may look dense, they were incredibly light and airy, probably because I used a hefty amount of baking powder giving them plenty of rise and lightness. The crumble topping had some heft but the muffins themselves had a delicate crumb. Preheat oven to 425F and line a 12-count muffin pan with liners; set aside. To a large microwave-safe mixing bowl, add the butter and heat on high power until melted, about 45 seconds. Wait 1 minute for the butter cool slightly and add the egg, sour cream, sugars, vanilla, cinnamon and whisk until smooth. Add the flour, baking powder, baking soda, salt, and whisk until just combined (over-mixing causes tough muffins). Fold in the chopped mango, (I used a large handful of frozen mango that I heated for 1 minute in the microwave to thaw, then diced it) optional add-ins, and stir to incorporate. Distribute the batter evenly among the muffin liners; set aside. To a medium microwave-safe mixing bowl, add the butter and heat on high power until melted, about 45 seconds. Add the remaining ingredients and stir until streusel comes together, ranging in size from small marbles to fine sand. 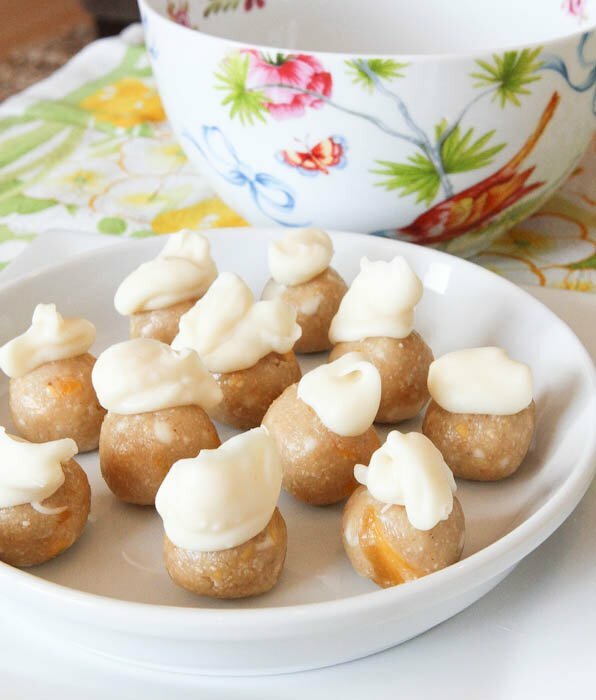 Spoon a tablespoon or two of topping on top muffin batter, distributing topping evenly among the dozen. Bake for 425F for 5 minutes (a hot oven gives them the ability to rise fast and finished muffins will be puffier as a result). Lower temperature to 350F and continue baking for 13 to 15 more minutes, or until tops are barely browning or a toothpick inserted in the center comes out clean, taking care not to overbake (total baking time 18 to 20 minutes, or until golden). Do you like mango? Crumble topping? Have a favorite muffin recipe? I have a one-bowl, Blueberry Streusel Muffin (vegan, gluten-free) recipe that’s a snap and works with any fruit (frozen or fresh) you have on hand. 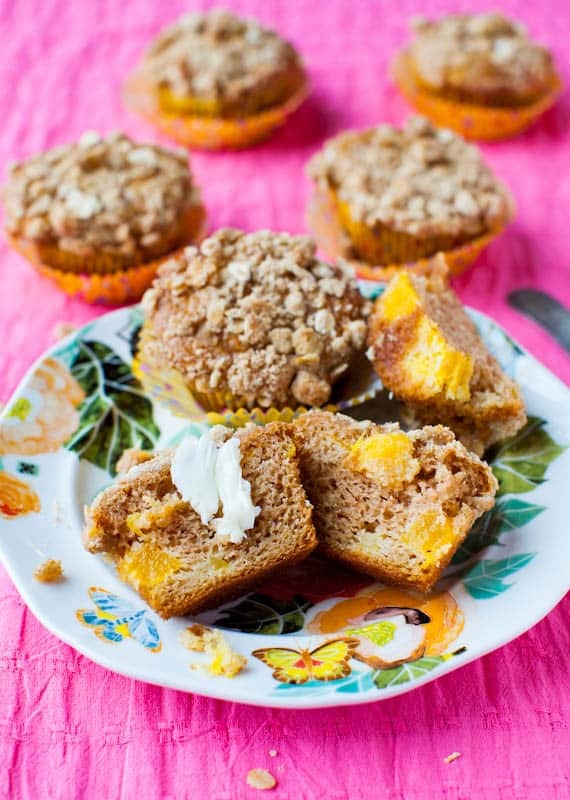 If you have any favorite muffin recipes, mango recipe, anything with crumble topping, link them up. You can never have too many tried-and-true recipes, especially for muffins. Kind of like chocolate chip cookies or banana bread, there’s a zillion ways to make them and everyone has their own “best” recipe. I’d love to hear about yours. I think it was fate that you didn’t have any blueberries – these look awesome! These muffins look fantastic. You are the whiz at whipping stuff together that you have on hand. Love that. So economical and creative at the same time! I’m cursing you for showing that strawberry bread holy cow! And who are these strange people that add nuts to streusel toppings?! That’s against nature. 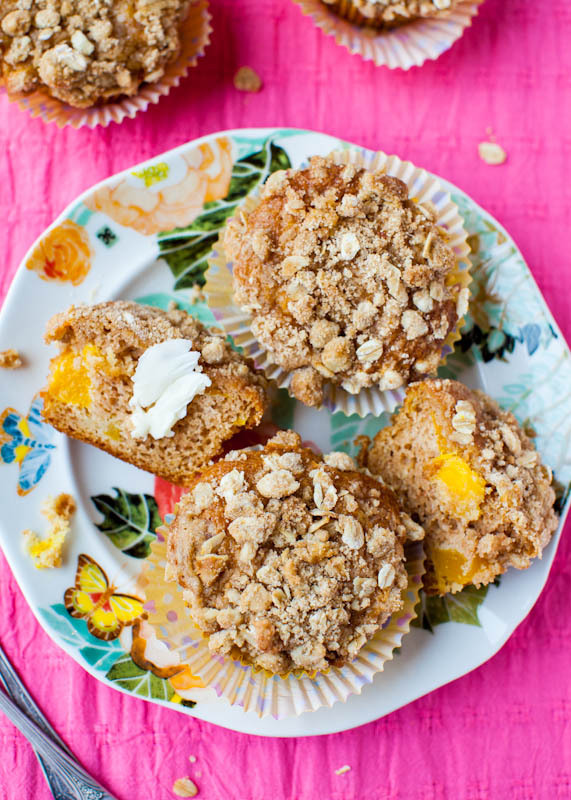 These muffins look amazing, I’ve never baked with mango I need to try it! I’m a huge fan of sour cream in baked goods, I love the tangy-ness flavor it adds. 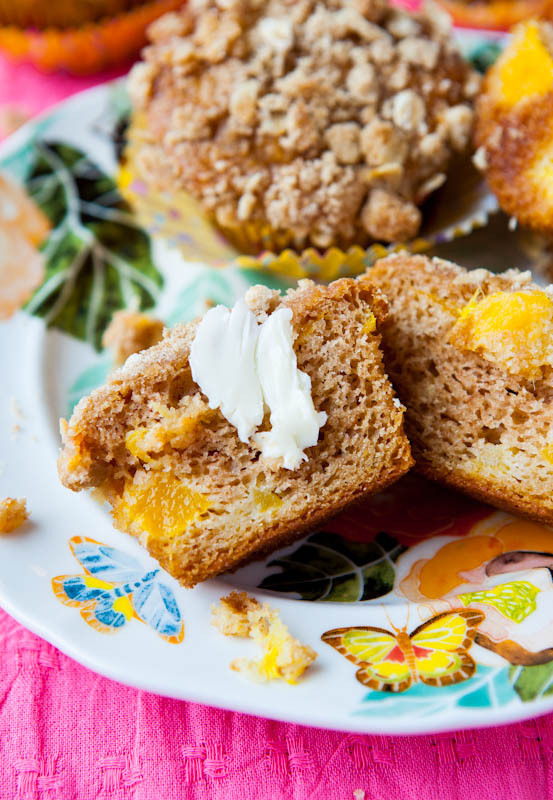 Thank you for posting the mango and sour cream muffins recipe. 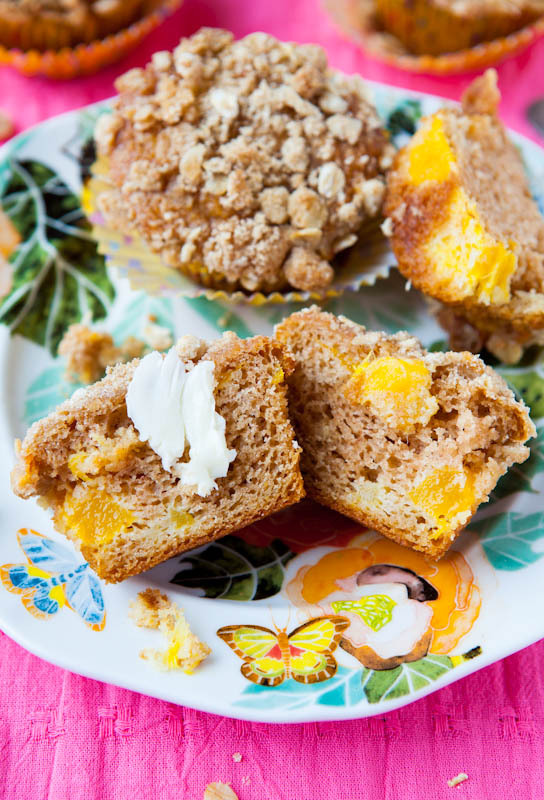 These muffins look so delicious, what a great way to use mango! And I read your blueberry bread post from my Reader and then saw it on FG. It’s beautiful! Those chunks of mango look absolutely delicious. These look really aamizng! I almost never bake muffins anymore (I can’t resist eating them one after another) but I can practically smell them from your photos. Mmm! Made the mango muffins! Added 2 Cadbury chocolate flakes crumbled absolutely delicious! Used fresh mango peeled and diced! 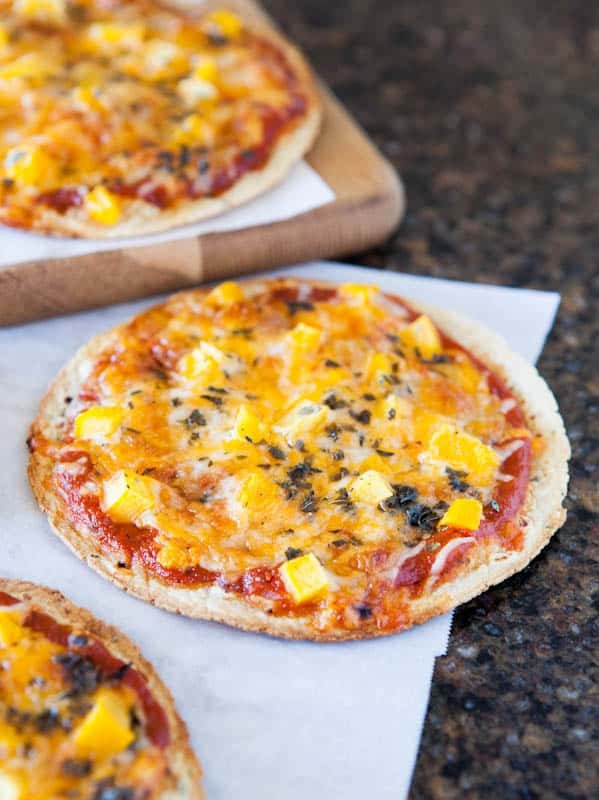 Loved these :) Def make these again! Thanks for the feedback and glad you liked them & will make them again!